Here are a collection of other PPG (and delta) Trikes and other miscellaneous flying machines of dubious origins. Some are production models, while others are prototypes or one-of-a-kind creations made by their pilot/owners. Feel free to send us your photos and a description of your own trike! Great PPG Trike discussion and more PPG Trikes can be seen at the Yahoo Group: Trikes & Flykes. Now there's even a group devoted exclusively to TrikeBuggy Owners. New Flat Top Design Trike! I am Dr. Rammohan Nair from Pune, India. I am sending a picture of my home made quad having wheel chair wheels. the wheel behind balances this light weight quad (only 12kg). the link for the home made video of the same is below. Ivo Prop – 3 blade - 52inch – Pitch set about half way. This is one nice TrikeBuggy Bullet!! I designed and put together this trike during the winter of 2009. It is made of steel tubing with fiberglass rear axles, with a 12 inch front and 16 inch rear Wheeleez tires with high speed steel bearings. It is 68 inches wide at the rear tires and an overall length from front to back of 64 inches. It weighs 38 lbs. "Nimbus Voyager is a beautiful combination of classic Tricykl and PPG." Yesterday I just tested first time my new selfmade miniquad. There's no foot steering, but it follows the canopy where ever I steer it. It feels like flying on the ground. I hope that on stronger wind it's also possible to stand up and make a normal foot launch before sitting down and throttle. I'll send videos later (if it works). Hopefully, I will be able to post more soon. The painting inspired from the wellknown 'WWII Flying Tigers' Pappy Boyington'. squadron. Thank you very much hope it will be interesting for you and others. Hello, my name is Przemyslaw Mieszkalski. Is it possible to put one or two pictures of a trike to your site? My friend is a producer of such equipment and I'd like to make a suprise to him. Trike - X-Max, 4-stroke V2 engine, 630 cc, 33 hp, electro starter. Because of that the engine is extreamly stable and quiet. Suming up it's a very high quality european trike. More info on www.motoparafly.com. There is a new development of the Grasshopper - Paratrikes. This is the folding and lockable front part of the arches, with the annoying and cumbersome getting on the front seat, or under the arches through to the back seat of the past. A Quickpin away, and the closure system opens. Miniplane Trike using a Top 80! It looks like a very simple and light PPG Trike, and it would have to be, it's powered by the smallest PPG motor available! Michel from Belgium sent me some pictures of a new PPG Trike. I don't have much information at this time, but you can clearly see that the frame design is based on the Flyke, a unique articulating steering system that uses the wing to guide the trike while launching. The motor pictured on the photo is Fresh Breeze's new Sportix Simonini, a foldable frame paramotor with a fresh new design with a double ring cage made specifically for PPG Triking. Looks like it is currently available from Fresh Breeze. Very interesting! If you ever wanted to shred the air (and pedestrians) in your wake, here is your chance. Why attach propeller to a perfectly normal car? Because you can! Because you can rid the car of transmission, clutch and brakes. Because you can utilize air power and powerful aircraft engines. This is an awesome collection of Helica's, Aero-Cars, Propeller Cars, Prop Bikes and more! Johnny is the infamous prop repairman that got pulled over backwards over and over in the DVD "Risk & Reward". He has made a few trikes in his long and illustrious flying career. These are the ones that he's flying now, but he has plans for more soon! Got three and a half million sitting around? If so, the Aerocar can be yours! This is an actual working vehicle that was made in 1956. It has over 1000 hours of flying logged and only 300 hours of driving! Annual inspection of engine and plane was last performed on July 30, 1976. This is a true CLASSIC! Tweedy Bird wanna go fwy da Twike! Not the first time this has appeared, and probably not the last. Much discussion has recently explored the possibility of using wheels to assist tandem flying with powered paragliders. Since we can't use a trike, there might still be some benefit in using wheels to take some of the weight of the heavier motor needed to fly two people. "In any case, the Trike can be equipped with a mast and be used with a hang-gliding flight from adequately reinforced. With only one engine can easily choose to fly with paragliding on foot or by cart, or the hang-gliding with minitrike. Nobody can give you so much!". "Providing what man has been dreaming of for decades, this vehicle is designed to deliver exciting acceleration and handling on the ground, as well as comfortable and reliable flight capability". At 1340 lbs., you'll need a Sport Pilot License at least to be able to fly this baby. Cool idea, but maybe just a little too 'Pie in the Sky' to bring to reality - check out the video! hello here my carriage built in rule of mason aluminium. thank you for your site, for the ideas that it gives and its simplicity. Here's a new machine! Manufactured in the USA by an established PPC firm, the Green Eagle is the new kid in town. Looks like it's available as either a trike or quad, and construction looks very solid. There's talk of a four stroke motor or a propane fueled machine! Looking forward to getting more information about this. ...looks like they make paratrike scale working models as well! Congrats with your exellent site, it gave me plenty of tips and idea's on how to make my own. I have not flown yet , but can't wait to take it skywards. Hi here is one for your other ppg trikes and flying machines page. Made by me jim beeley, pap ross 125 mounted on peter lyn kite buggy with some additions, flown with a tandem dudeck cabrio reflex wing. Here's a Delta Trike that seats you side-by-side. Looks like a real nice machine, and with a Rotax 582 on it, I bet it's a bit pricey, too. If you got the Dough, and your Sport Pilot License, this could be a real nice choice, as long as the company can get SLSA compliance. Bigger Pic & Website. A cross between a dune buggy and a paraglider, the Skycar prototype is a steel-framed all-terrain vehicle running on a biodiesel-modified Yamaha R1 1000cc motorcycle engine making around 140 peak horsepower. The motor runs through a Continuously Variable Transmission either to power the rear wheels or to turn a large rear-facing propeller via a belt drive. More & more & MORE! i am not a company - i am privat . pleas giv me a chance. I like it, but I can't understand a word of what they have printed on their website! Really a great concept for winter flying with the totally enclosed pod fairing, but I really like flying with my knees-in-the-breeze! John Fetz sent me this and more pictures of trikes and a hang glider owned by a female pilot in North Carolina named Jackye. From what I can see, she's quite a flying bird! my eldest son RJ. He has been doing a lot of ground handling, throttle control and kiting practice at every oppertunity! Its all starting to become second nature, so it wont be long! New for 2000 from Paladin Industries is the Paladin SPARROW. The Sparrow is a lightweight (145 pounds), Part 103 compliant single seat powered parachuted designed with all of the features and technology of larger ppc's! Unique to the Sparrow is the TiltBar HANDSTEERING. This is the same style of steering found on most trikes. Maximum payload 250 pounds, power is supplied by a 30-hp Hirth F-33 engine. The Flylight Dragonfly is a sub-115kg single-seat flexwing microlight. The Dragonfly will fold up to fit in the back of many cars. Using the specially-modified Aeros Discus 15T wing, the entire aircraft can be stored at home with the minimum of time and effort. Fuel burn is as little as 2.5litres per hour with the Bailey 4-stroke engine. Kent has now built eight PPG Trikes, and has learned a lot in the process. He is making his trikes all-terrain capable and foldable from powdercoated steel. A little heavier, but very durable. Kent also is inviting any and all pilots to come visit him at his Airpark near Punkin Center, 30 miles south of Limon, Colorado. Please call him first at home: 303-838-1599 (or cell: 303-888-3002 which does not work at his home). Terry Lutke has been developing a four stroker that can be attached to the rear of our TrikeBuggy Bullet, as well as his own Cheap Trike with the same power plant. These are the first pictures I have seen of the new unit, and it good to see the two trikes together. If of some interest for your website you may publish / show some of my elaborated 'hobby-trikes' on your website.. (I sell one occasionally) All are elaborated from ULM PDM body's with certification. Congrats with your exellent site, it gave me plenty of tips and idea's on how to make my own. 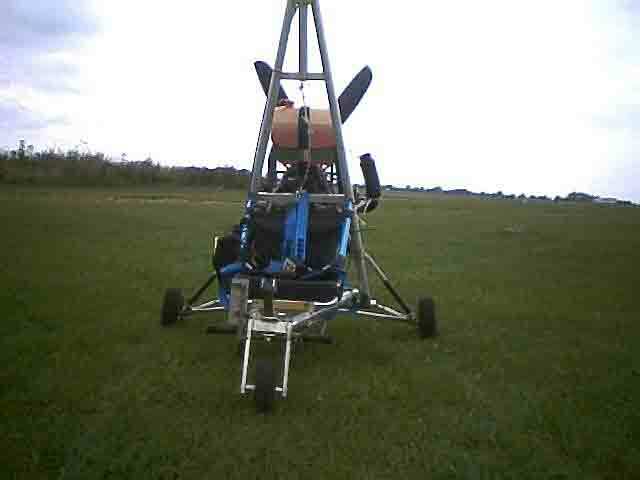 It's a Peter Lynn buggy, I widened the rear axle from 110 to 160 cm, welded some copy of the powerloops, reinforced the joints and made a quick mount system for my Fly Products cage. 30 secs to mount it! I have not flown yet , but can't wait to take it skywards. Thanks for the idea's, keep up the good work. Here's an innovative new form to try! As John Fetz sez: "All we need to do is put POWER BARS on to hook up...who needs 3 or 4 wheels, anyways?" Put two of these together for an AWESOME new version of the QUAD!!! The PropBike was my first "non-static test-bed" to run my wooden-props at certain advance design speeds with pilot drag interference that I was investigating once, in 2003. Very successfull to that purpose and, also, a funny (but noisy) thing to use around the city streets and in trips to the airport (with a lot of very open eyes of the car drivers). I built three ones to others argentinean mad friends. If it isn't too much work, please, should you put a link to my blogs (and a little explanation about the purpose of the PropBike), beside the picture? In Spanish: (BLOG#1) (BLOG#2) Use this link to TRANSLATE. I am a designer/builder of hand-made wooden-props for paramotors, airboats and ultralights airplanes. I live in Argentina (South America), near Brazil. Thanks in advance and congratulations for your site. Thought I would send you out a couple of pics of my prototype trike that I have been working on. Powered by a Fresh Breeze simonini 122. Castered front wheel..Currently have it set up with Roleez wheels/tires, but need to invest in high speed bearings, cooked the stock bearing on the first ground trials! I am taking it back out to the salt flats in the morning with some azusa wheels and tires... will send you some updated pics. The Aerochute Dual is a simple and safe way to fly. The Aerochute Dual is a two seater powered parachute designed specifically with safety and ease of operation in mind. It is designed to be virtually stall or spin resistant and in the case of an engine failure it simply lands safely as a parachute would. Made in Austraila. WOW!! This is quite a conrtraption! Really an awesome looking machine and good website, but definitely not 103 legal! Study for your Sport Pilot Licence and go get'em!! There's something missing on this trike! Oh yes, it's the FRONT WHEEL!!! Guess they're planning on some aggressive leg action on the part of the passenger (paddinger). Unfortunately, not legal here in the US with the expiration of our Tandem Exemption. The PPG Trike with the incredibly slanted motor! The wing is not very protected from the "blender" either. Not much info on this PPG Trike, but it looks straightforward enough. 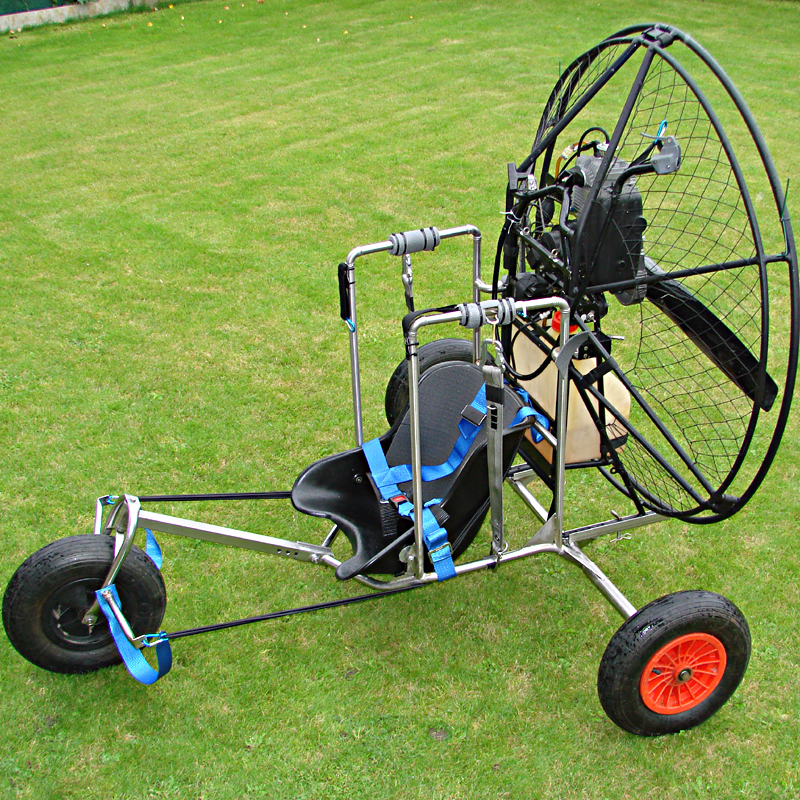 Air Light Systems makes two PPG Trikes along with some paramotors of their own. The Birdy is their single place PPG Trike, and the Birdy Max (pictured) is their two-place tandem trike, featuring an elevated back seat for the passenger with the pilot seated in front! You know when you're really getting old when you need to use a walker to launch your PPG! Good thing those wheels are castered in case you trip or fall sideways! Looks like a good way to keep from breaking those hip bones. Reverse inflations should be a snap in this puppy! It took the genius of the Swedish Aerosports to incorporate the motor into a lightweight, aerodynamically clean motor harness in the late 1980's. They have been producing the Mosquito since 1989, and have succeeded in bringing truly easy foot launch capability with this harness that folds up into a slightly oversized pod harness bag, all for less than 23 kilograms. This guy really is innovative! He has added a rear wheel from the keel of his hang glider attached with cables to strengthen it, and is using the DoodleBug Powered harness to fly with. I wonder how he steers the trike when launching, it looks like the front wheels are castered. This is not exactly a trike, but still a noteworthy powered hang glider flying machine. One of the unique features of the Doodle Bug is the pilot is able to "sit" in the harness, similar to that of a trike pilot, for comfort. The unit also has a set of "retractable legs" which once airborne tuck up under the fuselage. The Para-Cycle™ is a powered parachute and a recumbent bicycle that becomes a street-legal ultralight aircraft. The Para-Cycle blends these two inventions, creating a whole new kind of sport transportation. One of the new members of the Trikes & Flykes send the address of his website along with a recent post. Unfortunately, the site is in French, so you'll have to use BabelFish to translate it unless you know the language. The trike looks simple and somewhat similar to a kite buggy, but not quite as low of a CG. Turning ocean winds into gold while cutting greenhouse emissions in the process might sound like some sort of alchemy for the 21st century. The ship will make its maiden voyage in January across the Atlantic to Venezuela, up to Boston and back to Europe. It will be pulled by a giant computer-guided $725,000 kite tethered to the mast. Full story. Spartan Designer Stefano Introduce the DFS® (Dual Face System). This trike has a dual function; if you decide to utilize the parachute, then fly slowly and enjoy the skies... If you yearn for performance choose the powered glider and the sky is the limit. Or even have the best of both worlds. Website or More Pics. Jerry and I were neck to neck in the pylon race. As we hit the first pylon, I take the inside and Jerry is right behind me. As we head down the straight away, Jerry gets too close to my wingtip. Our propellers become entangled in each others wings. Gasoline spills as we become a falling mass of dacron and aluminum. I pull the ballistic parachute handle and it fills over our heads just before we contact the ground. But the gasoline ignites and we DIE in a ball of flames! Actually Jerry is probably at least 30 feet away. We don't fly this close except for pictures. Flying with Jerry was a lot of fun. let me introduce you our trike called Nimbus Inox Trike. Nimbus-paramotors makes a simple PPG Trike for its own paramotors, it is superbly designed and engineered; lightweight (9 kg) and strong, and is simplicity itself to assemble. Frame can be disassembled for travel in less than 5 minutes. This was the first "trike buggy" I saw. I thought, what a simple idea, just use a good quality kite buggy for wheeled launches and landings. The only thing I did not like was using the paramotor seat as the pilot's "high chair" - too much exposure to injury in the case of a rollover. The TrikeBuggy design was inspired by these early buggy test pilots! I can't recall where this picture of someone's homebuilt came from. Looks to be well made, although the front tire is rather small, and it's another "High Chair". Inspiration for the current TrikeBuggy models came from pilots like Bill that pioneered PPG Trike flying with kite buggies strapped to their paramotors! It would not be good to flip this trike - right over onto your head! You don’t have this one on the trike photo gallery, so I thought you might like to add it. It’s the Airgate trike from Czech republic, built to suit the ‘Mantis’ unit they produce (www.airgate.cz). It’s the only trike I’ve flown so can't compare it with anything else, but I did a fair bit of research and as I had the mantis/Kudlanka unit, this suited me well. I’m very happy with it for its low COG, powerful 130cc motor, very portable and light, (11kgs trike only). Perhaps some of you wish to add PPG triking to your 'bag of tricks' in 2008, however if you didn't find one under the tree you might consider the CheapTrike. The unusually inexpensive, sturdy CheapTrike is built in Terry's Michigan shop, and it's designed to be adaptable to almost any paramotor. Super simple PPG Trike with nice finished touches! Soll für alle Drachenflieger einen besonderen Service anbieten. Hersteller, Konstrukteure und Händler, die sich mit der Motorisierung von Drachen beschäftigen, geben wir die Möglichkeit, auf unserem neuen Internetportal ihre Produkte zu präsentieren. Dieses Gerät ist somit kein komplettes Motorschirmtrike, sondern ist vielmehr eine Zusatzausrüstung, mit der man sein Rucksacktriebwerk zum Trike aufrüstet! Es passt zerlegt komplett in den Kofferraum eines PKW, und man benötigt keinen Hangarplatz oder Transportanhänger! I couldn't have said it better myself. Larger picture. Wait a minute - Is that Johnny Fetz? Or is that just one of his motor/trike combos? From Bolivia comes this photo of a homebuilt PPG Trike flying in - well, is that a STADIUM??? Better check FAR 103 rules closely - OOPS, that's right - it is South America!!! A new PPG Trike from South Africa - nDiza Trike! Aliseo - The Flying Boat! Combining all the performance of the previous Aliseo model with a new sophisticated design and more powerful engine, the Aliseo II was created for those who want the best of everything. Jerry started with the Fly Products Flash Trike, but he didn't stop there! Bucket seats, special engine mount for the Monster and off-road wheels and tires are some of the mods that Jerry added. Wayne Michener and Leon Wacker are icons in the PPG Trike industry, and they are frequent attendees to many of the larger Fly-Ins arounnd the country. Here, Wayne is seen thrust testing his Quad with the specially modified Compact Radial 313cc motor. Mounting Mike's Simonini was actually quite easy using the newer Hip and Motor clamps we designed. Mike is also sporting the new, square design Power Loops - lowering the risers and brake positions for the Deluxe Buggy. Looks like a Fresh Breeze Monster on the back of this interesting trike. Made for use with both hang gliding and paragliding wings. Pretty cool looking design with those curved bars! Nice low center of gravity with a protective roll cage. At the moment I'm testing the production type of the single seater. This trike is now making his hours for the paramotor certification in Germany. After the certification in March the trike will be sold all over the world. Here is a new picture of the improved trike. The trike is called the Vortex and is built by PDP-Trikes from Holland. This trike has a development of more than two years. This to make sure the trikes behaviour will be excellent on the ground and in the air. Jerry's modified StingRay Flyke is a unique machine. A one-of-a-kind trike built for comfort and speed! Features rear axle Slider technology, a robust front end and powered by a Fresh Breeze Monster Hirth 313cc paramotor. Built on the Flexifoil Kite Buggy, this trike is powered by a WalkerJet Paramotor. Pilot sits in the harness attached to the motor frame. DK built some remarkable PPG motors for awhile, and this intense looking trike for their motors. This looks like Jeff Goin wondering if this monstrosity will ever leave the ground! Built on the tried and true Flexifoil Kite Buggy, this trike uses a cage and harnesses to secure the occupants while flying. Powered by a WalkerJet Paramotor. Built on a homemade kite buggy style trike, this trike features a bucket seat and hang points you can see over (although this may not be so good for "wheelbarrowing" - notice how the hang points are BELOW the thrust line). Powered by a Fresh Breeze Paramotor. With an aluminum frame, this trike looks pretty robust! I don't know what the facial bandages are all about, but the CG of this trike looks rather high. Powered by the Monster Hirth 313cc Fresh Breeze. Mr. Fetz has always been an innovator, mostly known for his prowess at propeller repair. Gotta love the little mirror on his helmet to watch for approaching motorists! This simple frame design features the Roleez wheels for excellent shock absorbtion and the ability to launch from a variety of ground surfaces, including beach sand, gravel or rocky ground and grassy fields. The paramotor clamps onto the frame quickly and easily, and the rear axles are removable for transporting the trike. The Fly Products Flash Trike allows for extremely quick and easy application of the paramotor onto the trike and the low position offers high stability during take off. Designed for single-place (solo) use, the Firebird Trike allows you to easily mount virtually any paramotor to the sturdy aluminum frame to enjoy the benefits of trike launched PPG flight. The Kits Trike was named for the its assembly and breakdown features. When dismantled, the pieces can easily be transported in a small amount of space.